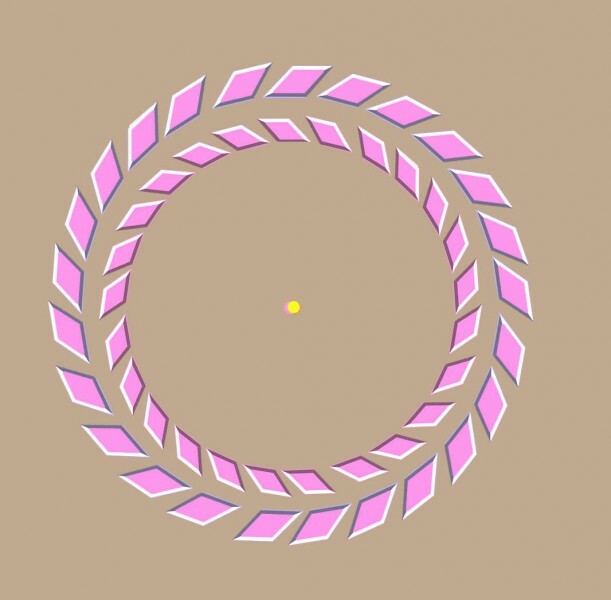 If you can see this illusion, you may be amazed to discover it’s not an animation. 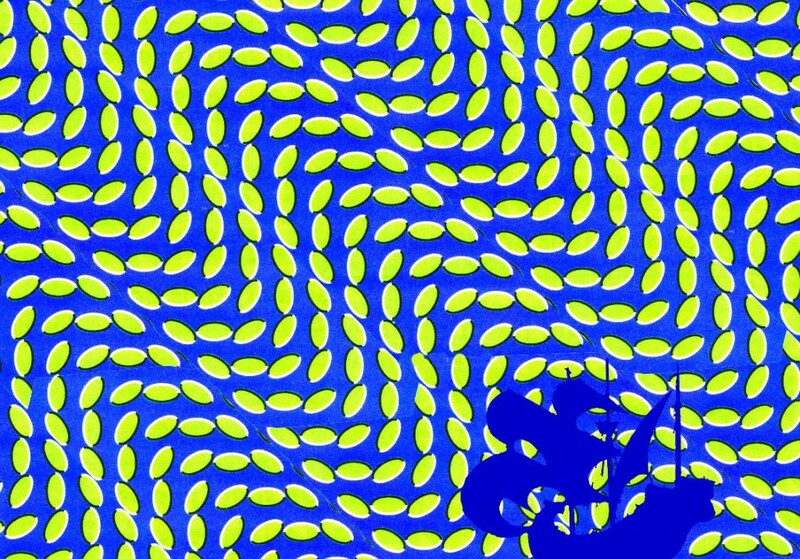 Most people will see waving movement, yet the pattern of lozenges is not really moving at all. But about 5% of people just don’t see this kind of illusion, and if that’s you, it doesn’t mean anything’s wrong. If you do see the movement, it won’t be wherever in the pattern you focus, but in the periphery of your field of view. However, the effect is also very sensitive to size. I see it vividly with the screen about 15 inches (36 cms) from my eyes, and the image 8 inches (21.5 cms) wide on the screen, but I think you’ll get an even better effect by clicking on the image, if a bigger version then comes up on your system. It’s a kind of illusion only discovered in the last few years. Lots of discoveries about it have been made by Japanese researcher Akiyoshi Kitaoka, and on his site (amongst scores of other stunning illusions) you’ll find his masterpiece in this line, his famous rotating snakes illusion. Update 4/9/12! I just found out that the image I based this picture on is also one of Kitaoka’s. I just changed it to make the pattern more wavy. (Updated at 30/5/12). The sequence of tones across edges in the patterns is crucial, from dark to mid-tone to light to dark, as is the size of the elements, and the regularity of the pattern across the field of view is important too. It’s probable that the effect of movement arises because the brain takes longer to process the junctions with quite low contrast, for example from green to white, than the junctions with lots of contrast, as from white to blue. There’s therefore a time difference across each pattern element, in a direction that depends on the orientation of the element. The time and direction differences are picked up by movement detectors in peripheral vision, and because they are syncronised for elements of similar orientation, the elements appear to move as coherent blocks. In my ocean wave example, diagonal columns of elements with light edges uppermost alternate with columns with elements with dark edges uppermost. The columns therefore seem to move against one another. 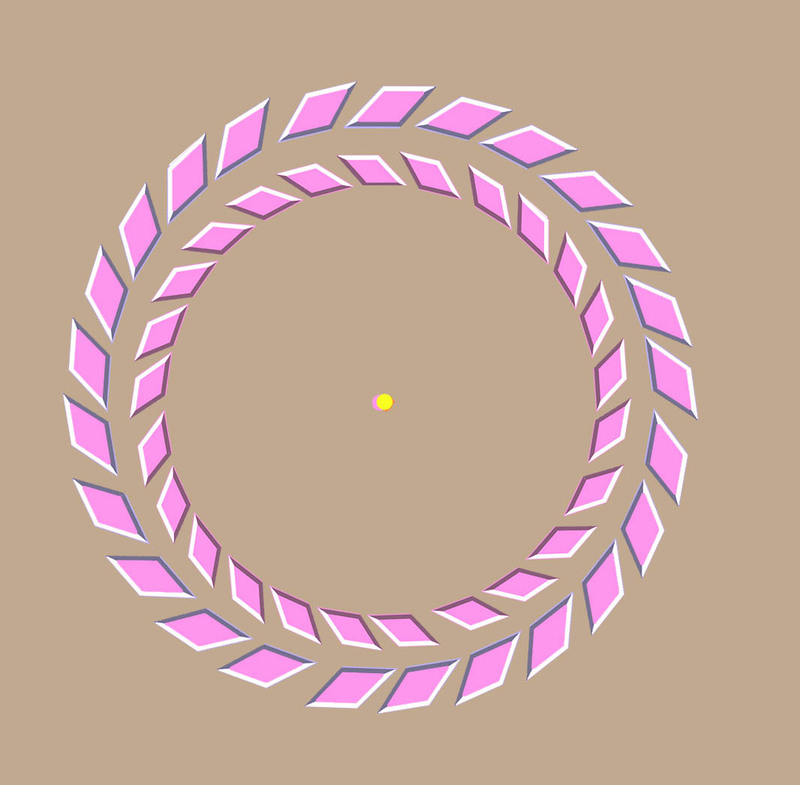 Here’s another demo based on the related Pinna-Brelstaff illusion: focus on the yellow spot, and move your head towards and away from the screen. All being well, you’ll see the outer ring turn one way, and the inner ring the other. Don’t forget to keep fixated on the yellow dot. Want to get seriously technical? There are a number of heavyweight papers on the effect by now, including this one with Kitaoka as one of the authors.